Are you an active social sharer? Do you share only certain types of content, or is your life an open book online? As part of the POPSUGAR Insights "Find Your Happy" study, we asked women to tell us what types of content they prefer to share online. Overall, 80% of women have posted photos they have taken themselves online. Seventy-two percent of women have posted or shared inspirational quotes or images, and 71% have shared photos that were taken by friends or family. With social media being the new dream journal, teen girls were much more likely to post quotes or images (82%) than adult women (68%). Rounding out the leading content was personal text-based commentaries or status updates, which were shared by 69% of women. 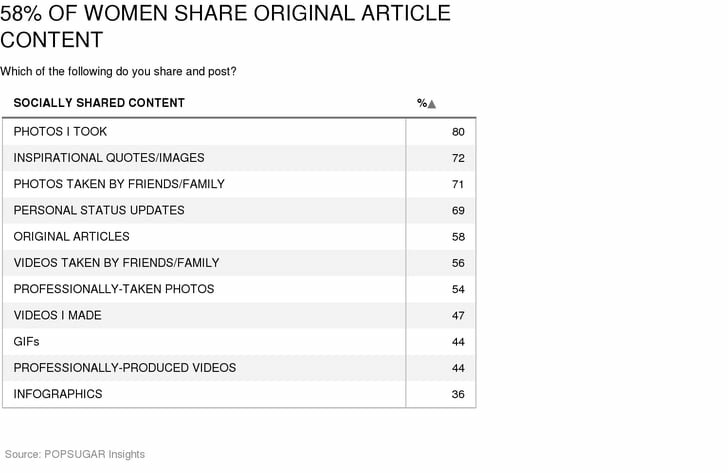 Nearly six in 10 women said that they post or share articles that they find, and this action was more likely to be conducted by millennial women aged 18-34 (64%), parents (67%), and employed women (63%).